Ever wonder what’s in your gut? Your gut health can be incredibly important to good health. It’s an emerging science that you’re likely to hear a lot more about. 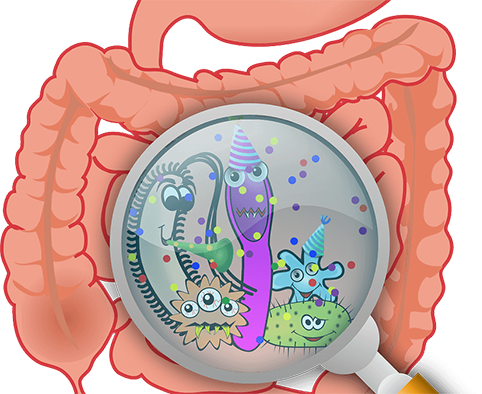 First a little background: The human digestive system is naturally inhabited by billions of bacteria that are collectively called the microbiome. Most of the bacteria resides in the lining of the human gut, which contains about 3 pounds of bacteria. The balance of beneficial and harmful bacteria is vital for immune health, and can be thrown out of balance by a wide range of circumstances. These include antibiotic use, poor diet, excess alcohol intake, stress and disease. In circumstances like these, beneficial bacteria can decrease in number, allowing harmful competitors to thrive. Beneficial bacteria aid in absorption of nutrients, fight against infections and help with digestion. Poor gut balance can cause digestive problems including gas, diarrhea and constipation. Emerging research is showing healthy individuals tend to have a more diverse makeup of bacteria compared to people with certain diseases. Research is being done studying the link between gut bacteria and almost every disease in the body. While the evidence is still forming, there appears to be a link between certain cancers, obesity, inflammatory and intestinal diseases and bacteria makeup of the gut. How do you build up the good bacteria and lower the number of bad bacteria in your gut? Look to prebiotics and probiotics. Prebiotics feed the good bacteria already living in your gut and include leeks, artichokes, asparagus, bananas, legumes, red wine, honey, maple syrup and oatmeal.